Identifying your customer will help you with your marketing, sales strategies and overall development of the direction of your assortment. Whether you are a startup who needs to identify your customer to properly position for marketing or an established brand that is evaluating brand direction, your customer is king and queen. This post is dedicated to startup companies who are struggling with identifying their customer based on either a lack of sales or because you are in the process of launching. The second section is for brands with selling history that need to analyze their customer base to make strategic decisions. Getting inside the mind of your customer before having sales starts with a lot of sleuthing. Here’s ideas on how to start the process. Your list should effectively yield a target list of brands that are competitors or potential collaborators, blogs, influencers and magazines that are actually relevant to your customer, and potential stores you will be selling you. You should also check your price points to make sure you are within reason of what your customers will spend. This means double-checking your direct competitors to do apples to apples comparison. As your brand grows your customer will self identify by purchasing and engaging with your brand. If you have been selling for three seasons with no traction, its time to re-position your brand and look at your pricing, assortment planning and branding. 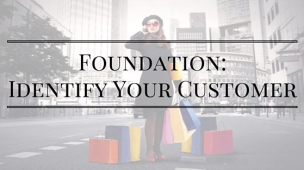 Check out the Launch My Brand workshop to get in depth coverage on how to identify your customer and market effectively. If you have selling history on your brand, you might be wondering how to maximize this information. 1. Analyze what is selling by category, color and price point. Develop an assortment plan for future collections based on this and then layer on the creative direction and inspiration. 2. Review where the most sales are coming from. Etsy? Ecommerce? Wholesale? PopUp Shops? Leverage this information to get in front of your customer more by being where they are. Develop a strategy to maximize these channels. 3. Communicate with customers so you can introduce new categories and products. It’s essential when scaling your brand to grow in ways that your customer will support. So before you take the time to produce outerwear when you are known for dress shirts, ask your customer what they want and give them what they need. Your selling history tells you what is working and what isn’t. Making money is the litmus test to tell the success of a business, otherwise you would be running a charity or this would be a hobby. For more ideas on how scale and develop your brand for the next 5 years contact me and we can set up a consultation. Syama Meagher is the CEO of Scaling Retail, a retail consulting firm that works with fashion brands and retailers internationally. Scaling small brands as well as working at companies like Barney’s & Macy’s, we craft business plans, looking at multiple revenue streams to give you a solution that fits.